This set of tough Chemical Process Calculation Questions focuses on “Energy Balance terminology – IV”. 1. A ___________ is any variable whose value depends on how the process takes place. Explanation: A Path variable is any variable whose value depends on how the process takes place. 2. Which one is not a path variable? Explanation: Internal energy does not depend on the path. Explanation: A State variable is any variable whose value depends only on the state, not on the previous history. 4. Which one is a state variable ? Explanation: All a, b, c are state variables as these are only depended only on the state, not on the history. II: The process takes place so fast that there is no time for heat to be transferred. Explanation: Both I and II are the properties of an Adiabatic system. 6. Which one is an intensive variable? Explanation: All three Pressure, Temperature and Volume are intensive variables as these are not depended on the path . Explanation: Heat transfer is caused by Temperature difference. 8. Heat is ___________ when transferred to a system. Explanation: Heat is Positive when transferred to a system. Explanation: Heat is negative when transferred to the surrounding . Explanation: A process in which no heat transfer takes place (Q=0) is an Adiabatic process. 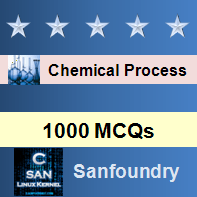 To practice tough questions on all areas of Chemical Process Calculation, here is complete set of 1000+ Multiple Choice Questions and Answers.